Walking Trail Guide of trails within their holdings. the cable vehicle barrier. 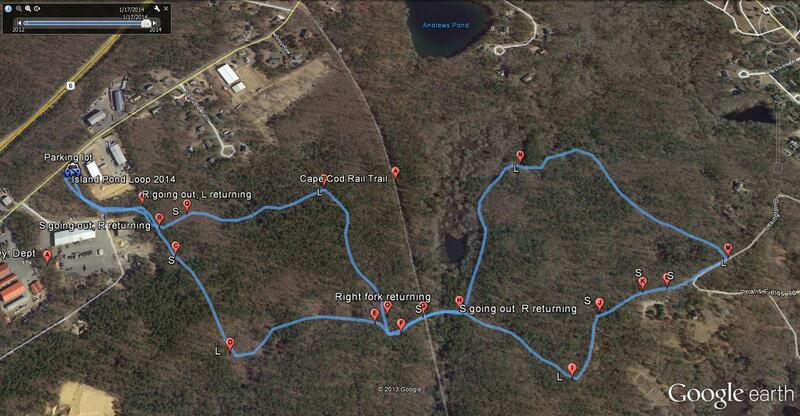 Follow it to a ridge overlooking Olivers Pond, about 0.2 mile. Walk down to visit the pond. Then backtrack to the dirt bike track that you crossed, heading west paralleling the shore of the pond. In another 0.2 mile, you will reach a dirt road heading south. It is Hawks Nest Road. If you miss the path to Olivers Pond, you will see this road joining Spruce Road in 0.6 mile from the start. Walk south on Hawks Nest Road for 0.4 mile from Spruce Road, to an east-west track that is Round Cove Road. Walk west on it to a vehicle turnaround near the south shore of Hawks Nest Pond. Walk down to the pond for another scenic vista. Then backtrack to the turnaround. Look for a path heading west, that has been thoughtfully provided for you by dirt bikers. Follow this path as it heads southwest above the south shore of Black Pond, then comes to a dirt road in 0.7 mile from Hawks Nest Road. we had this walk routed around Walkers Pond, but that old woods road has been blocked. The new route skirts the boundaries of the park on a friendly and scenic dirt road. Continue north for 0.6 mile to Spruce Road. Walk east on Spruce Road to the start. The walk is about 3.7 miles. Park at the Sand Pond lot just north off Great Western Road. 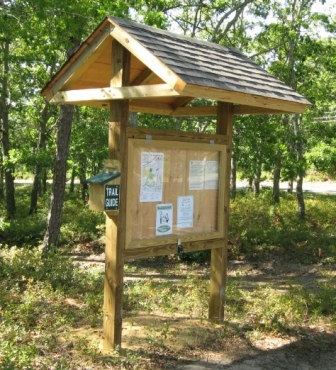 Walk south across the road from 001 to 002, then west on the utility right of way or the Cape Cod Rail Trail to 003. From there, pick up a woodland trail that traverses Bell's Neck to 004 and 005. Walk south on Bell's Neck Road to 006, then follow a trail around the west side of the cranberry bog to a woodland road leading to the Herring River, and the fish ladder to the Reservoir, at 008. Stop to inspect the area, especially if the alewives are making their annual migration from the ocean. Circle around the bogs counterclockwise from 009 to 016 , then back to 008. Walk the foot path to 017 and 018 at Bell's Neck Road. Walk out on the bridge to view the Herring River and the marsh. A side trail from 019 to 020 takes you to North Road and a footbridge for more views of the area. Return to Bell's Neck Road and the parking lot. The walk is about four miles. Note: The following two short walks may be followed as a long walk on the same day. A shuttle is suggested from Headwaters Drive to Depot Road, or vice versa. General description: This delightful oak and pine woodland walk lies very close to the center of Harwich. The loop described herein is a 2 1/2 mile walk on practically level ground. There are a couple of small rises. The trail is open, smooth, and easy to follow. Parking: From route 6, take exit 10 south to the first traffic light and turn right. This will get you onto Queen Anne Road. Watch on the right down about a mile for the "Pro Fence" sign and just beyond it you will see a brown sign showing two hikers, across from which is the parking lot which holds about 6 to 7 cars. There is no fee for parking here. The map: The accompanying map is almost self-explanatory, but the text will follow it closely. You will find markers A through P showing all major intersections on the loop. They are labeled "S" for go straight here, "L" for turn left and "R" for turn right. Minor intersections or overgrown trails are not labeled and when in doubt continue on straight. The trail: Face the kiosk and take a moment to read the description of the trail posted there. The red and black arrow signs will point the way as well as the map. When there is a disagreement, follow the map, as vandalism is common in this area. The trail begins to the right of the kiosk and winds around between a large warehouse and the town Highway Department. At intersection A turn right and continue straight through intersections B and C. At D, the trail curves to the left and there is another road going down to a cranberry bog ahead of you. Go left here. Continue through points E and F. Pass a fork going in the opposite direction but stay straight and then turn left at F in a large clearing, passing G, where you cross the bike trail and head down over a small culvert to point H and continue straight. You will reach this point again on the way back. After a long straight traverse you will reach point I, turn left here onto a large dirt road, following it past points J, K, and L, on to point M, where you make a sharp left onto a narrower trail. Go straight on this trail until you reach point M, where two black and red arrows point you to turn left onto a similar sized trail. Keeping to the left at all times you follow the trail past an old cranberry bog and return to point H where you turn right, crossing the bike path again and reaching point F where you follow the right fork this time to point O and go straight to point P. Turn left at this crossroads and follow the trail past point Q back to the intersection at point B, turn right, and trace your way back to the parking lot by turning left at point A. You have now completed the 2 1/2 mile loop. We hope you enjoy it. Park behind Harwich Town Hall, which is 0.1 mile east of Route 124, on Main Street (Route 39) in Harwich Center. Easy access is from Old Colony Road which runs behind the parking lot from Route 124 to Oak Street. The topo map was last updated before the Old Colony Rail Trail was paved. Going east from (001) to (011), simply stay on the paved trail. Before it makes a sharp loop to the left, about 200 yards ahead at (002), you will see markers for a foot path south through Thompson's Field to a parking area on Chatham Road (003). south from (002). Either one will get you to (003). walk or ski north on it to (004). Either way, go east to (005) to rejoin the paved trail. In about a half-mile, look for a path heading west. When you come out in the clear in the north section of Thompson's Field, you will see the parking lot for access from Route 39 (009). From there proceed south through the scrub (010) to (011) to rejoin the paved trail, and return to (001).